September 28, 2019 • Celebrate Bethania with a festival of arts, crafts, and music. The Black Walnut Festival is held annually on the last Saturday in September. Free Admission • Enjoy a tour of the Wolff-Moser Museum House with authentic period furnishings. Next door, the Visitors Center museum highlights the history of the Moravians in Wachovia. Enjoy a self-paced tour of Historic Bethania, a European style “open field” agriculture village and designated National Historic Landmark. Choose from four beautiful trails through conservancy forests and preserved farmlands. Parking at trail heads, options from .7 mile to 1.5 mile routes. "These rich and fertile lands. . ."
A National Historic Landmark, the town of Bethania is the only know existing Germanic-type Linear Agriculture village in the South. A self-directed tour map is available in the Visitor Center or here for download. Take a leisurely walk down Main Street, and see the carefully preserved and restored homes and stores. Most of Bethania’s historic homes are private residences, so please be respectful on your journey. Bethania’s conservancy-protected lands include four hiking trails through verdant forests and preserved farmlands. The Black Walnut Bottoms Trail is a 1.4 mile trail that begins beside Alpha Chapel and extends through Black Walnut Bottoms forest and farmlands areas. The 0.7 mile Graveyard Trail begins in the Mill Shoppes parking lot and loops behind God’s Acre. The 0.8 mile Orchard Trail begins at Bethania-Rural Hall Rd. and loops through the Old Orchards preserved lands. Reuter Trail, at 1.42 miles, includes a forest walk, and a loop that borders Muddy Creek. 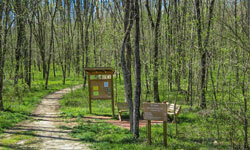 Trail maps are available at each trailhead, or download here.